What if controllers had feelings? What if every time you yanked a power cord, your console started to scream? What if your games could cry? 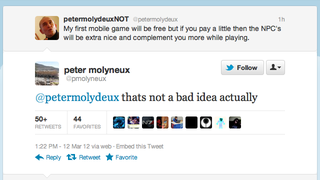 By now you must have seen Peter Molydeux, the fake Twitter account that parodies legendary game designer and Fable creator Peter Molyneux, who recently left Microsoft to start his own studio. Molyneux is clearly a fan of Molydeux. Their tweets have even started sounding similar. So the real question is, when are they going to partner up and start making games? Or a console? It's hard not to be excited at the prospect of a PlayStation with arms or an Xbox that laughs every time you tickle its disc drive. Or a game that gives you points based on the politeness of your smile.